It's been far too long since the last Teenage Fanclub album, that I know. One spin of only a few minutes of the new one, Here, out Friday on Merge Records, convinces a listener of this fact. But, really, was there any doubt about the enduring strengths of this outfit, or that they'd gone and gotten even better, somehow, in their years away? 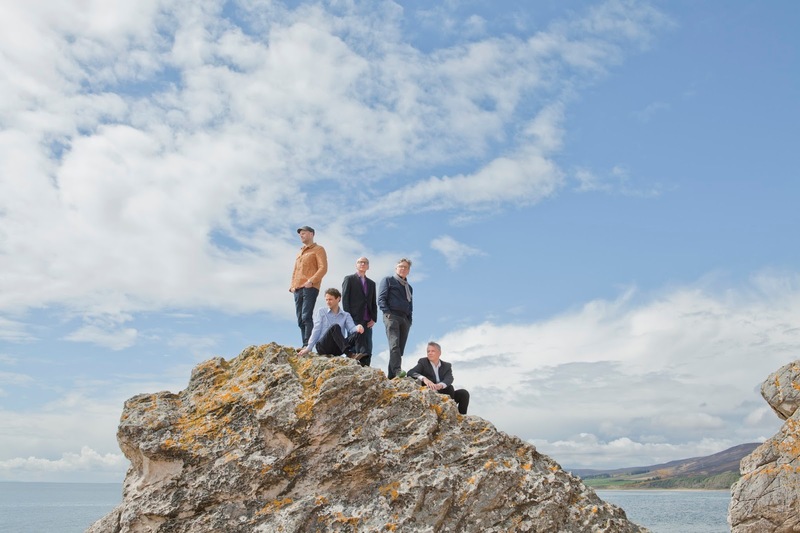 Teenage Fanclub -- Norman Blake, Raymond McGinley, Gerard Love, Francis Macdonald, and David McGowan -- have cultivated a career that has spanned parts of 3 decades by any reckoning. First gaining substantial Transatlantic attention as a sort of grunge-y, near-shoegaze act on the back of the seminal "Star Sign" single, the Fannies have refused to be pigeonholed, despite the obvious classic rock touches that are sprinkled throughout the tunes of their output. And it is in the harnessing of those power pop influences that the band has been most successful, etching out a career that has lasted longer than the alt-rock boom that carried them aloft on the major labels in this country for a spell. Case in point: Here opener, "I'm In Love" is so good, so stunningly perfect in execution, that perhaps only a band like Teenage Fanclub could have ever pulled this off. Direct and positively sunshine-infused, "I'm In Love" is perhaps one of the 10 best songs this band has ever released, and it's the culmination of those mid-period singles that owed so much to the work of Chilton and McGuinn, as much as those early cuts owed so much to The Jesus and Mary Chain, for example. By now, so many decades in, the Fannies have jettisoned most of that noisier indie stuff from their sound to focus on a more "classic" kind of songwriting. Pure and simple is the approach now and "I'm In Love" is very nearly perfectly pure and simple. Elsewhere, the band give in to a full-on Byrds crush with the Norman Blake-penned "The Darkest Part Of The Night", a tune a good deal more straightforward than some of the bent pop on the man's collaboration with Euros Childs of Gorky's Zygotic Mynci, the fab Jonny project from 2011. On the Gerard Love-composed "Thin Air", the Fannies show those boys in The Jayhawks how to do this sort of thing, while another Love cut, "It's A Sign", bounces along like one of the best early Paul McCartney singles that never quite made the Top 40. The band's proto-Britpop past is highlighted in the trippy "Steady State" from writer Raymond McGinley. His "Hold On" is also another highlight of Here, especially as the cut echoes so many from the peak Grand Prix-era from this band. But the same could be said about stuff like the Blake anthem here, "Live In The Moment", all chiming hooks and warm harmonies. If the band has toyed in the past with the affectations of other genres -- post-C86 noise on those Catholic Education cuts, Big Star styles on "What You Do To Me", and so on -- it's clear by now that the band are at their best when making the kind of music found here on Here. Others -- The Posies, The Jayhawks, The Pernice Brothers -- have tried to do this sort of thing but, for whatever reason, these dudes from Scotland are far better at making this Americana-tinged power pop than any Yanks. And they do it without anything superfluous being added to the mix, and without getting lost in the near-country affectations that bedevil so many who attempt this sort of music. As Here closes with the sublime "Connected To Life", you find yourself wanting more. If this final track is more spacious and transcendent than the others here, it's still similar in approach. If the other cuts on Here are all Big Star, than this one is pure Chris Bell. And while lots of bands have these same influences in their collective holsters, it's the ease with which the lads in Teenage Fanclub fire off riffs from the same arsenal that makes these musicians so legendary. Not a note is wasted on Here and one can say that even a non-fan of this band -- but how could such a person even exist!?! -- could approach this record as a master-class in songwriting. Economical and lush in equal measure, the cuts on Here confirm Teenage Fanclub's importance. And, frankly, there's so much life-affirming joy in these numbers that I just don't see how anyone could not love this band and be so glad that they were back. Here by Teenage Fanclub is out Friday via Merge Records. Follow Teenage Fanclub on the band's official blog, or on the band's official Facebook page.